Recently, we polled readers and commenters about the reasons why they downvote comments. While we often get feedback about how downvotes work on Disqus, it’s less common for us to hear about why people downvote comments. By understanding these motivations and goals, this paves the way towards improving how voting works in the future. Today, we’re sharing the results of our research and summarizing the feedback you provided. Why do you downvote comments? After one week, our poll received 5,007 votes with 2,790 comments posted in the accompanying discussion. While people may downvote a comment for multiple reasons, we wanted to identify the primary reason. We also acknowledged that the reasons listed in the poll were not comprehensive. That is why we listed “Other” as a reason and encouraged people to post a follow-up comment to explain further. 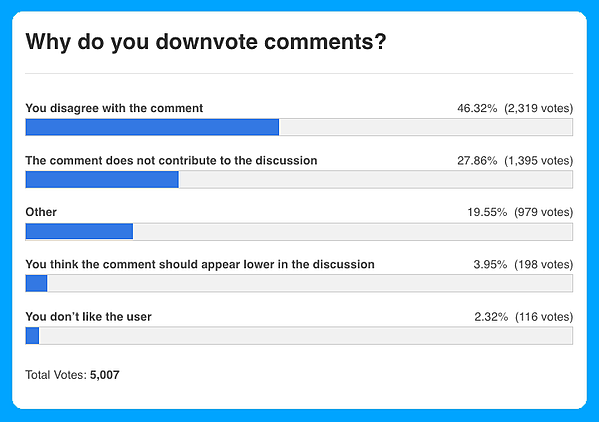 With nearly half of the vote or 46.32% of respondents, “you disagree with the comment” was the top reason why people downvote comments. 27.86% of respondents said that they downvote because “the comment did not contribute to the discussion”. 19.55% of respondents indicated “other” as their reason for downvoting. The two most common responses shared were “comments that were rude” and “comments that contained false information”. “You don’t like the user” received the fewest number of votes in the poll, garnering just 2.32% of the overall total. We didn’t receive many comments about this specific reason so if you voted for this and would like to weigh in, post a comment in the discussion below. In addition, we received 83 comments from users who said that they don’t downvote comments. People said this was either because they thought it had no effect or were discouraged from using it since we don’t show the downvote count. This surprised us. If you disagreed with the ideas or opinions expressed in a comment, should the appropriate feedback be to downvote it, therefore lowering its visibility in the discussion? We assumed that only a small minority of people would hold this view but we were wrong. It’s also possible that people downvote a comment they disagree with because they assume their vote has no effect on the comment’s position in the discussion. In retrospect, we should’ve made the reason more specific in the poll (e.g. “I disagreed with the opinion or idea(s) expressed in the comment”). For instance, some of the comments discussing this mentioned that disagreement came as a result of perceived incorrect or misleading information as opposed to an opinion or viewpoint. One person also chimed in about why they don’t downvote comments they disagree with. Respondents also shared additional reasons for downvoting comments that weren’t listed in our poll. One of the top responses we received was that people downvote comments they think are rude or offensive. If someone was being a jerk or trolling users in the discussion, the comment would get downvoted. People also downvote comments they believe contain false or misleading information. It’s one thing to argue over different viewpoints on a topic. Facts establish common ground for discussion and when a comment is perceived to include incorrect information (intentional or not), people would downvote it. Approximately 3.95% of poll respondents downvote comments they think should appear lower in the discussion. This applied to discussions in “Best” sort which factors multiple signals including votes, flags, replies, and user reputation to rank the order of comments in the thread. Downvoting a comment would decrease its position in the thread relative to other comments. Show the downvote count in addition to the upvote count. Include a reason when downvoting a comment (e.g. off-topic, disagree with comment, does not contribute to discussion) so that the comment author would receive more helpful feedback. Show a combined vote count that subtracts total downvotes from total upvotes. Thanks to everyone who participated in the poll and shared their feedback with us! We know this won’t be the last time we talk about downvotes and really appreciate the thoughtful comments from the community. What did you think of the poll results? Do you agree/disagree with the findings? Let us know in the discussion below!